Cal here for Tuesday Stretch. 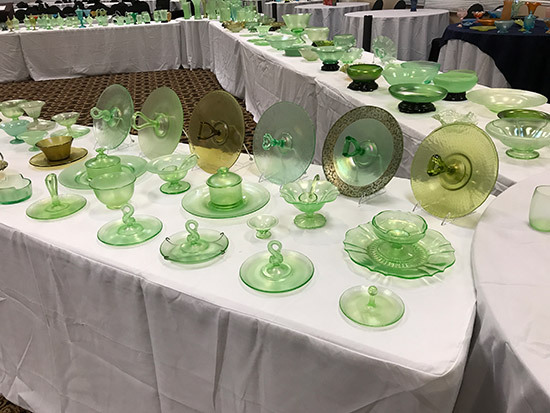 We shared some photos from the recent Stretch Glass Society convention with you as the convention was taking place but there are more photos which I believe you will enjoy, so I am going help you enjoy more of the green stretch glass from the 2017 Convention. 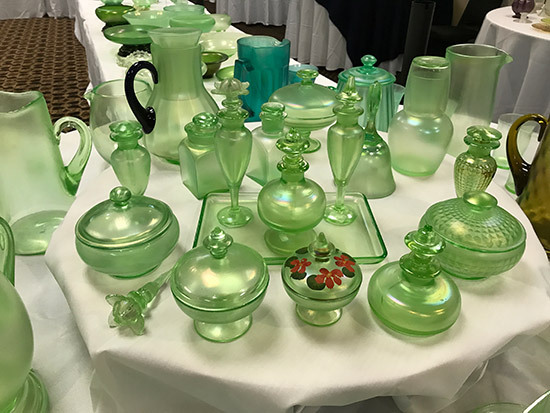 As you may recall from previous comments about the upcoming convention, The Stretch Glass Society assembles a “Club Display” at each convention. 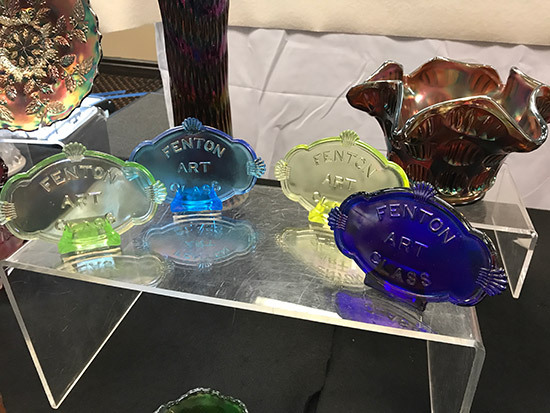 This display has a theme – sometimes we feature the stretch glass of one or more companies, other times we feature a particular shape or shapes of stretch glass or we invite our members to share stretch glass of a certain color or colors. This year we featured green stretch glass. 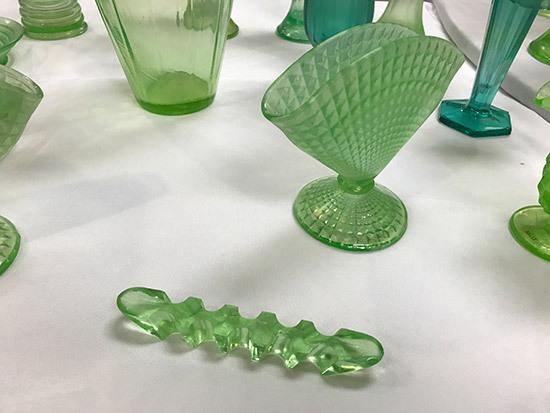 As with carnival glass, green is not always ‘just’ green. 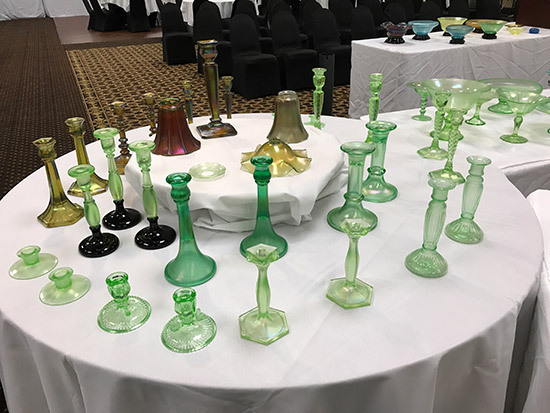 We have Florentine Green by Fenton and similar colored glass by other companies, Emerald Green by Northwood, Green Ice by Imperial, Green by Diamond and Central (slightly more blue, less yellow in the color), Russett by Northwood, Green Lustre by Lancaster, Nile Green and Green Opaque by US Glass, green by Jeanette and a few others which we include in the “Green Family.” When we put all of these together, it is quite a show. 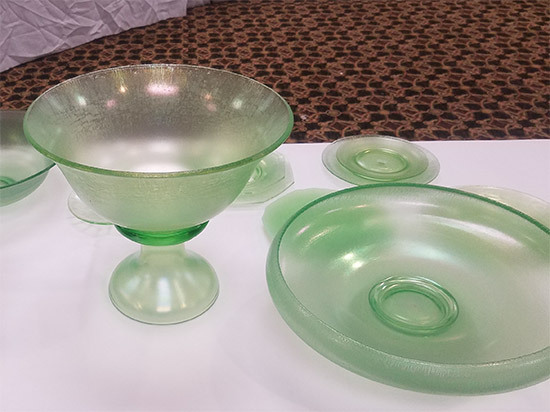 Look at this video of examples of green stretch glass by company – these are only examples; some companies made other green stretch glass not featured in this video. 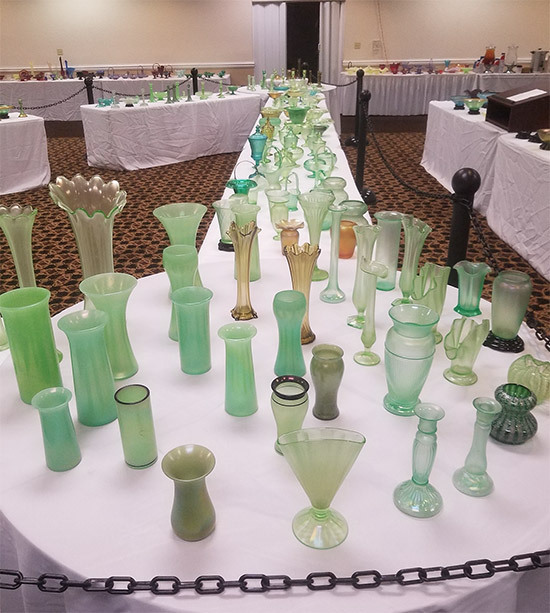 As you can see, the array of vases was incredible, again ranging in size from a huge funeral vase to a delicate bud vase. 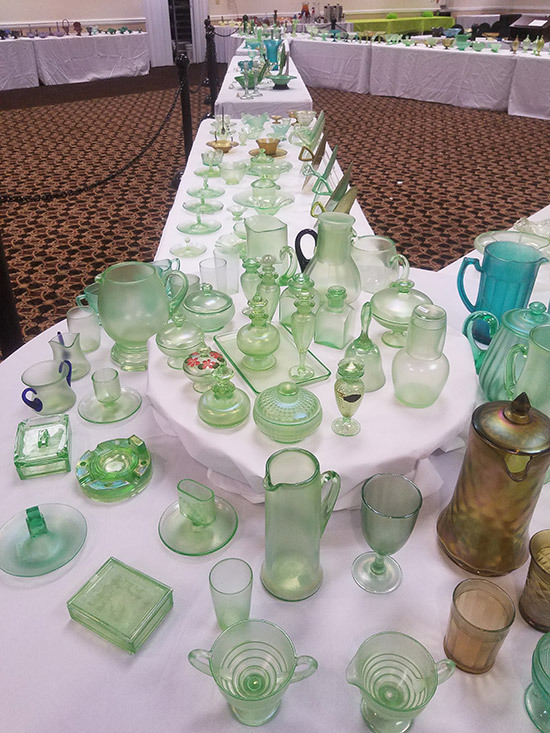 This display of green stretch glass was made possible by contributions (really loans) of glass from more than 10 members and included approximately 500 items. 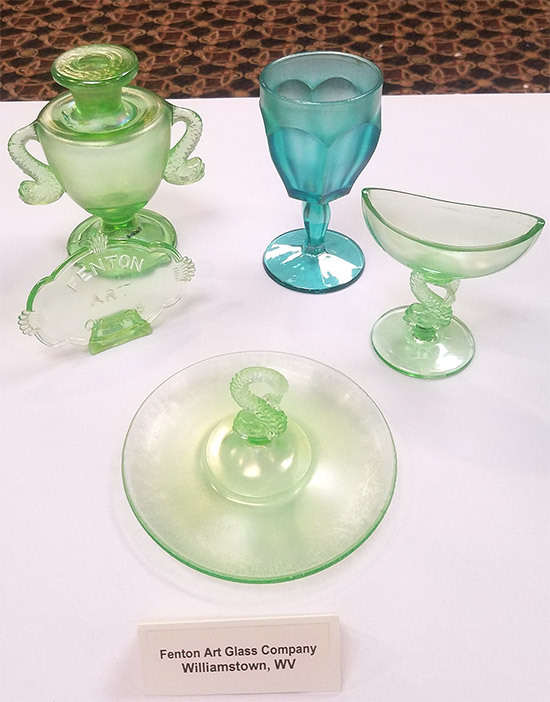 There was everything from a Punch bowl and a wide flared, cupped bowl (aka ice cream shaped) made from the same mould as the punch bowl, to an individual nut cup and individual salt dip. Finally, here are a few close-ups of various sections of the display. Here we see center handled servers from various companies along with mayonnaise comports, butterball trays, and the marmalade jar. Putting the servers side by side shows the range of greens. 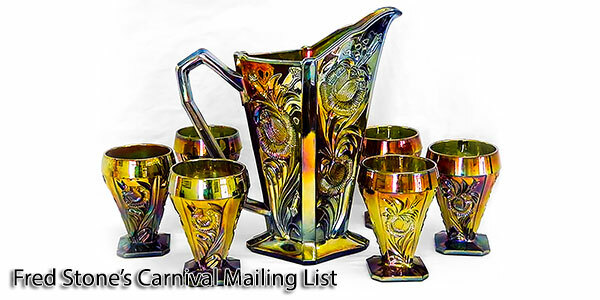 We were fortunate to have this great example of stretchy carnival glass in the display. 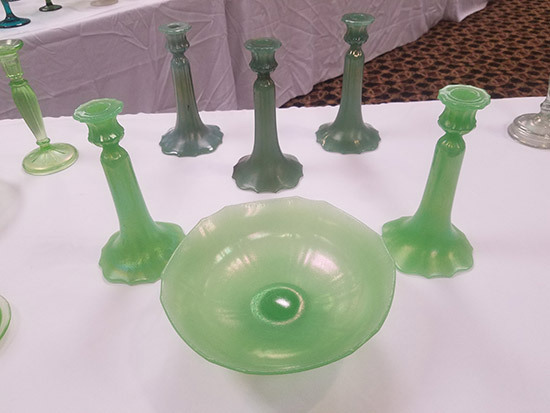 US Glass made opaque green glass, dubed “Jade Green” by them. Evidently there was not a lot of attention paid to controlling the mixing of the ingredients because here you see the wide variety of colors in which it is found. 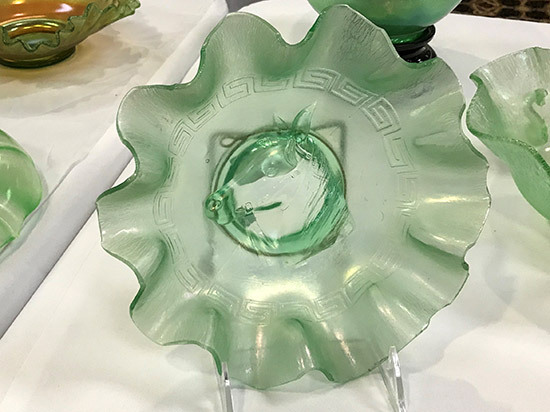 While fan vases are common in stretch glass, the flower frogs which were made to go in them are a hard to find item. This flower frog got a spray of iridescence, making it even harder to find than the ones that were not iridized. Seeing all this stretch glass in person is 100 times better than looking at the pictures but I hope you enjoy the pictures and see something in the display that you either have in your collection or wish you had in your collection. 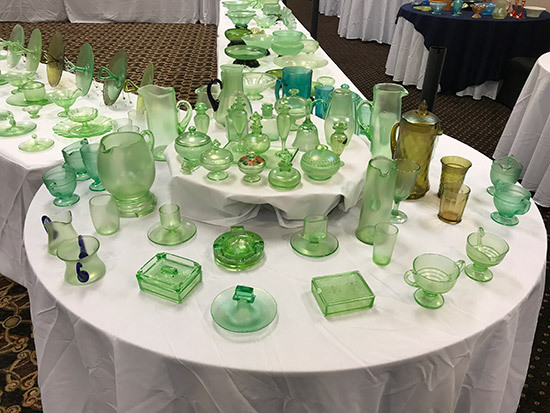 Assembling this much green stretch glass in one place at one time is no easy task; we have Bob Henkel, Vice President of The Stretch Glass Society, to thank for coordinating the display and our members for packing and transporting their glass to and from the convention. 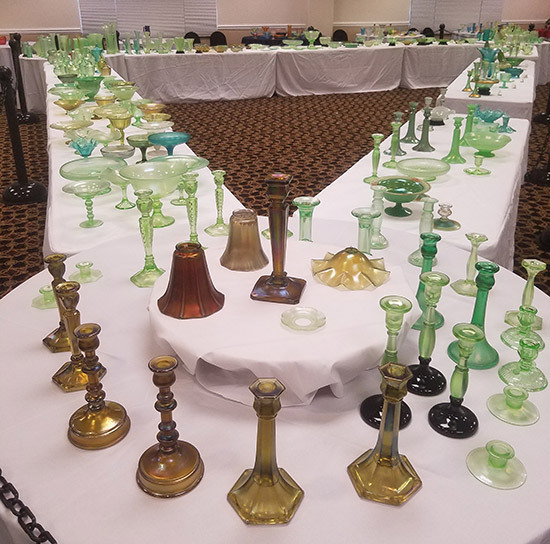 Bob reached out to members asking them to bring specific items and made sure that we would have a wide variety of stretch glass to provide both an educational and entertaining display for our members and guests. Next year our club display will feature Center Handled Servers on July 25,26 & 27, 2018. We will be back in Marietta, OH and would love to have you join us to learn more about stretch glass.